Boats see the worst of dirt, grime, salt, and fish blood, and keeping a boat clean can be extremely difficult. The dirty exterior and interior of a boat only gets worse with time, and before long you can be in over your head with cleaning. Most boats are constantly exposed to the elements in one form or another, and the saltwater, humidity, or moisture mixed with dirt and grime and never ceasing can leave you with a scrubbing job that could take ages. Half the reason you fell in love with your boat was its beauty, and it’s quickly become quite unattractive. At Spotless Cleaning, we provide the most professional and thorough Miami boat cleaning services, and we’ll have your boat looking brand new again. From top to bottom, we’ll get rid of any sort of grime and buildup that is causing you strife. Our Miami professional boat cleaners will give your machine a deep clean to keep it looking its best. We use professional-grade soaps and tools so that your boat gets a detail clean you won’t soon forget. And with professionally trained and licensed cleaners, we can guarantee 100% satisfaction on every job. As a local Miami business, we take it as our responsibility not only to adhere to all local guidelines and standards when it comes to our chemicals and cleaning products, but also to go beyond that and ensure all of our products are totally environmentally friendly. When it comes to detailing a boat, we know that it’s going to spend time in our oceans, and we make sure not to use any harsh chemicals that may pose a threat to the water or wildlife. 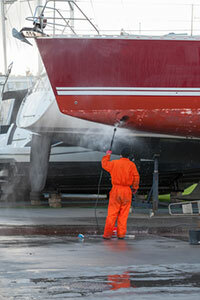 We also won’t use any super-concentrated detergents that we know can damage or strip away your boat’s finish. And we’ll make sure the boat is waxed to protect the boat from the elements and keep it cleaner longer. We’ll always keep you and your marine detailing needs ahead of trying to get the job done more quickly or easily. 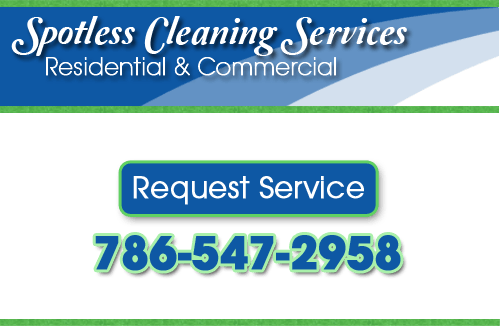 Spotless Cleaning will give you the most thorough Miami boat cleaning services there are. Any glass or perspex windows will be cleaned and polished with a non-abrasive scrub. Your seats will be cleaned, and all vinyl upholstery made to seem brand new. From cleaning your carpets to degreasing your engine, and polishing your metal to varnishing your teak, we’ll handle it all, and all with peak professionalism and superior service. If you’re looking for professional boat cleaning services in Miami, please call us at 786-547-2958, or complete our service request form.